This excerpt comes from my book and I originally posted the full section on October 20th, 2016. I think this is relevant to what is going on with Jupiter being birthed in September and Saturn being in Ophiuchus. Now keep in mind that the April event during Passover, Saturn is in Sagittarius at this time. This symbolizes the rider on the White Horse of Revelation 6 in my opinion. Here is the paper. 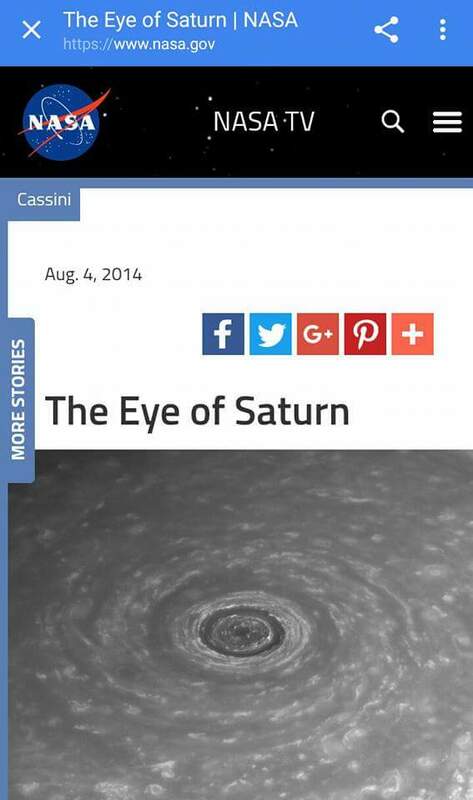 “I also want to bring up that this ongoing cassini to Saturn project will end soon. “After almost 20 years in space, the Cassini mission will end on September 15, 2017 at 5:07 a.m. PDT (8:07 a.m. EDT). Here’s how it will happen: In late 2016, the Cassini spacecraft will begin a completely new type of mission at Saturn. During its final months, the intrepid spacecraft’s orbit will carry it high above the planet’s north pole and then send it plunging between the planet and the innermost edge of its dazzling rings. Beginning on Nov. 30, 2016, Cassini will repeatedly climb high above Saturn’s north pole, then plunge to a point just outside the narrow F ring (the edge of the main rings), completing 20 such orbits. Then, on April 22, 2017, Cassini will leap over the rings to begin its final series of daring dives between the planet and the inner edge of the rings. This is the Cassini “Grand Finale.” After 22 of these orbits, each taking six days to complete, the spacecraft, will plunge into the upper atmosphere of the gas giant planet, where it will burn up like a meteor, ending the epic mission to the Saturn system. The spacecraft will make detailed maps of Saturn’s gravity and magnetic fields, revealing how the planet is arranged on the inside, and possibly helping to solve the irksome mystery of just how fast the interior is rotating. It will vastly improve our knowledge of how much material is in the rings, bringing us closer to understanding their origins.Cassini’s particle detectors will sample icy ring particles being funneled into the atmosphere by Saturn’s magnetic field. 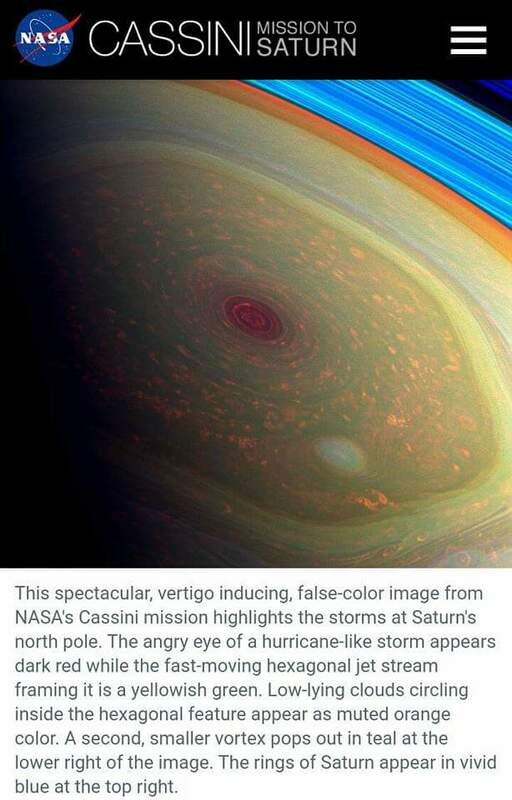 Its cameras will take amazing, ultra-close images of Saturn’s rings and clouds.This computer-generated view shows the view from the perspective of the Cassini spacecraft as it dives between the rings and Saturn’s cloud tops. So notice that the grand finale starts on April 22nd. This is during Passover. It’s almost like they are doing this symbolic sacrifice where they will plunge into Saturn. And the strange thing is this, its completely finished on Saturday (Sabbath) September 15th. The interesting thing about this date is that it’s a week before some believe the sign of Rev. 12 happens in the stars. I do believe this happened with the birth of Jesus in 3BC but I do also believe that this is a false sign that is connected to the man of sin. Now it may be connected to Saturn also. So you have the two important dates of Passover and Rosh Hashanah. The biblical name for this holiday is Yom Teruah (יוֹם תְּרוּעָה), literally “day [of] shouting/blasting”, sometimes translated as the Feast of Trumpets. So there you have it. 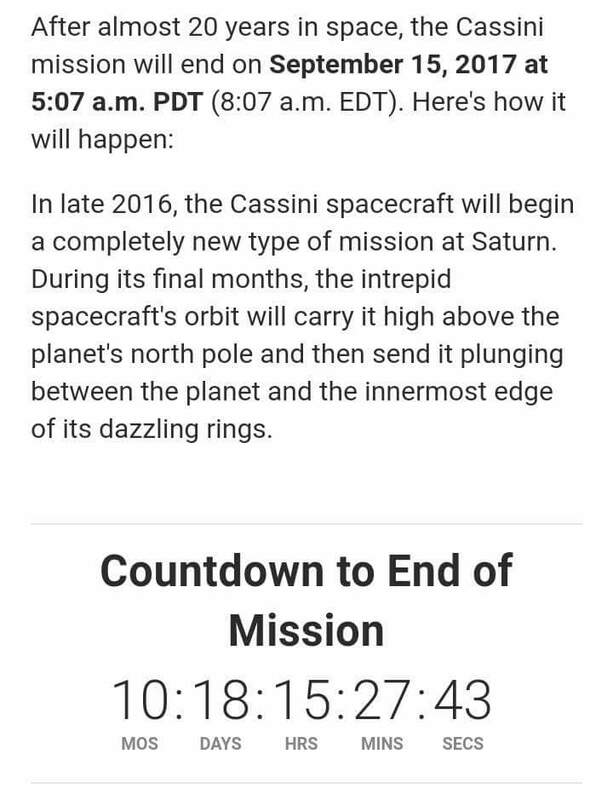 Cassini will sacrifice itself into Saturn during this time. This to me looks like a ritual in the highest degree. And I wonder if this stopping of the mission on Sept 15 means that there is a rebirth that is associated with Rev 12? Are we starting to connect the dots yet?